Greece’s financial drama has dominated the headlines for five years for one reason: the stubborn refusal of our creditors to offer essential debt relief. Why, against common sense, against the IMF’s verdict, and against the everyday practices of bankers facing stressed debtors, do they resist a debt restructure? The answer cannot be found in economics, because it resides deep in Europe’s labyrinthine politics. Official Europe chose the second option, putting the bailing out of French and German banks exposed to Greek public debt above Greece’s socioeconomic viability. A debt restructure would have implied losses for the bankers on their Greek debt holdings. Keen to avoid confessing to parliaments that taxpayers would have to pay again for the banks by means of unsustainable new loans, EU officials presented the Greek state’s insolvency as a problem of illiquidity, and justified the “bailout” as a case of “solidarity” with the Greeks. To frame the cynical transfer of irretrievable private losses on to the shoulders of taxpayers as an exercise in “tough love”, record austerity was imposed on Greece, whose national income, in turn – from which new and old debts had to be repaid – diminished by more than a quarter. It takes the mathematical expertise of a smart eight-year-old to know that this process could not end well. Once the sordid operation was complete, Europe had automatically acquired another reason for refusing to discuss debt restructuring: it would now hit the pockets of European citizens! And so, increasing doses of austerity were administered while the debt grew larger, forcing creditors to extend more loans in exchange for even more austerity. Our government was elected on a mandate to end this doom loop; to demand debt restructuring and an end to crippling austerity. Negotiations have reached their much publicised impasse for a simple reason: our creditors continue to rule out any tangible debt restructuring, while insisting that our unpayable debt be repaid “parametrically” by the weakest of Greeks, their children, and their grandchildren. In my first week as minister for finance, I was visited by Jeroen Dijsselbloem, president of the Eurogroup (the eurozone finance ministers), who put a stark choice to me: accept the bailout’s “logic” and drop any demands for debt restructuring, or your loan agreement will “crash” – the unsaid repercussion being that Greece’s banks would be boarded up. Five months of negotiations ensued under conditions of monetary asphyxiation and an induced bank run supervised and administered by the European Central Bank. The writing was on the wall: unless we capitulated, we would soon be facing capital controls, quasi-functioning cash machines, a prolonged bank holiday and, ultimately, Grexit. 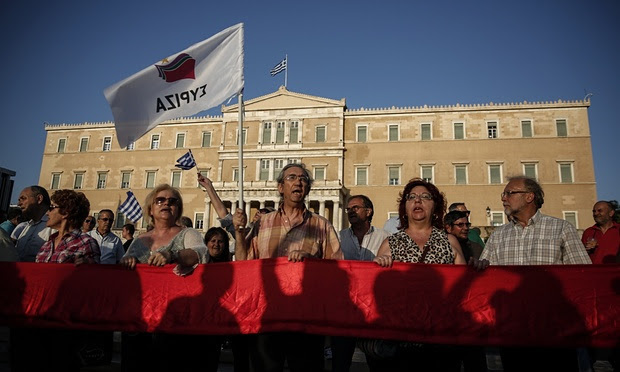 The threat of Grexit has had a brief rollercoaster of a history. In 2010, it put the fear of God in financiers’ hearts and minds, as their banks were replete with Greek debt. Even in 2012, when Germany’s finance minister, Wolfgang Schäuble, decided that Grexit’s costs were a worthwhile “investment” as a way of disciplining France et al., the prospect continued to scare the living daylights out of almost everyone else. By the time Syriza won power last January, a majority within the Eurogroup had adopted Grexit either as their preferred outcome or weapon of choice against our government. To exit, we would have to create a new currency from scratch. In occupied Iraq, the introduction of new paper money took almost a year, 20 or so Boeing 747s, the mobilisation of the US military’s might, three printing firms, and hundreds of trucks. In the absence of such support, Grexit would be the equivalent of announcing a large devaluation more than 18 months in advance: a recipe for liquidating all Greek capital stock and transferring it abroad by any means available. With Grexit reinforcing the ECB-induced bank run, our attempts to put debt restructuring back on the negotiating table fell on deaf ears. Time and again, we were told that this was a matter for an unspecified future that would follow the “programme’s successful completion” – a stupendous catch-22, since the “programme” could never succeed without a debt restructure. This weekend brings the climax of the talks as Euclid Tsakalotos, my successor, strives, again, to put the horse before the cart – to convince a hostile Eurogroup that debt restructuring is a prerequisite of success for reforming Greece, not an ex post reward for it. Why is this so hard to get across? I see three reasons. Europe did not know how to respond to the financial crisis. 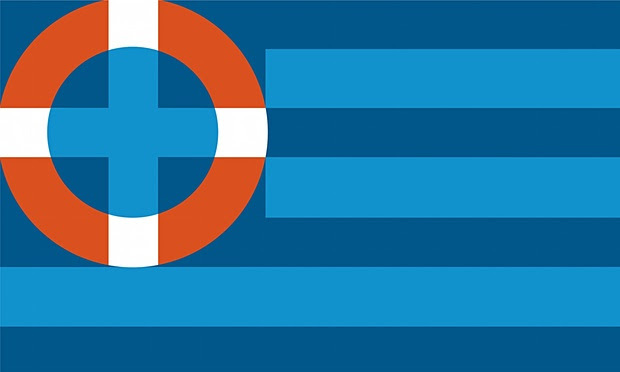 Should it prepare for an expulsion (Grexit) or a federation? The euro is a hybrid of a fixed exchange-rate regime, like the 1980s ERM or the 1930s gold standard, and a state currency. The former relies on the fear of expulsion to hold together, while state money involves mechanisms for recycling surpluses between member states (for instance, a federal budget, common bonds). The eurozone falls between these stools – it is more than an exchange-rate regime and less than a state. And there’s the rub. After the crisis of 2008/9, Europe didn’t know how to respond. Should it prepare the ground for at least one expulsion (that is, Grexit) to strengthen discipline? Or move to a federation? So far it has done neither, its existentialist angst forever rising. Schäuble is convinced that as things stand, he needs a Grexit to clear the air, one way or another. Suddenly, a permanently unsustainable Greek public debt, without which the risk of Grexit would fade, has acquired a new usefulness for Schäuble. I remember watching Tsapris addressing the Eu parliament last week and thinking what a strong and determined leader, full of confidence and almost smug at putting the finger up to the Eurocrats. Having just watched the Varoufacis video above I now think he has been an inside player ( for them ) all along. Fraud and Theft – along with setting up the mark and nailing vast fraudulent debts to the mark the loansharking cabal stole the assets. However, the deal didn't come as easily for Greece. German Finance Minister Wolfgang Schaeuble proposed that as much as €50-billion of Greek public assets must be transferred to an external fund and privatized over time. Essentially, this means Greece must hand over its public assets worth €50-billion — to the German-government owned fund to be sold by the Germans. The fund is called the Institution for Growth and controlled by the German bank KfW, a German government-owned development bank based out of Frankfurt. Now this is where things get awkward: the current Chairman of the Institution for Growth is none other than Schaeuble himself.